The wonderful Susan is hosting a meaningful food event campaigning against Osteoporosis thru Beautiful Bones. She wants us to recall that women have high risk of developing osteoporosis and we should take precautions at all ages. I believe that this is a worthy cause and so I concocted a high protein and calcium recipe. I am not really a dietitian but I know that lentils have high nutritional value and health benefits for their protein and fiber content. Cheese is very important too in providing the calcium that we need to have stronger bones that is if we have aversion for milk. Before I met my husband I used to hate drinking milk and eating cheeses (that probably explain my height J). As the saying goes, “when in France do as the French do”, I eat slowly, I savor each meal and most importantly I eat lots of cheese. I think there is no secret to a healthy long life but good diet, exercise, healthy living and lots of happy thoughts. I am sending over this photo too to Click, my favorite monthly photo event spearheaded by Jai and Bee of Jugalbandi. This month's theme are beans & lentils. Combine the mustard, vinegar, salt and pepper in a salad bowl. Add the oil and blend well with a wire whisk. Add the beets, endive,lentils, arugula and feta. Toss well and serve. Makes 4 servings. Lentils are a staple in the Greek kitchen and I don't have to tell you about feta do I? That my dear, is a meal! A beautiful salad and well chosen for this event! Oh, thank you Dhanggit! Lentils are a staple in our house--I love them in everything from soups to salads. So I know I'll love this dish, especially since it has sweet beets and spicy arugula (two of my faves). Eating healthy can be delicious as you clearly show. A nice take on lentils which I normally associate with hot dishes. A very sastisfying salad! What a delicious-looking sald! I also make a lentil salad with feta and cukes... yours looks really delicious! 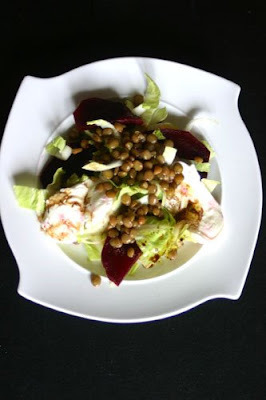 That's a really creative and delicious way to prepare lentils, my hubby will love this! i haven't tried cooking lentils but i like it. This really look and sounds good. By reading the recipe, i could taste it.You're really a chef. Ps: parang halaan ata yon coque sa tagalog, can't remember. i agree with you it's really good with pasta and soup. I do it with roquefort sauce, you should try itlike what i do with mussel. At kung may time ka.baka gusto mong magbakasyon dito. 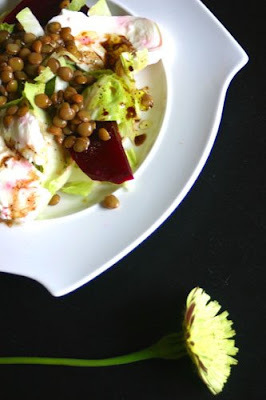 I love lentils and have made lentils with feta before but never thought of adding beets or endives! Great idea. This is another one of your recipes that I have to try! Simply yet so well made! I am a feta lover :D! This is an easy one, eto kayang kaya ng akong cooking power ! this is the dish that I was looking for, you know after all this festives dates, a healthy diet is soo necessary. This is a nice dish shared here. Great job done and thanks for sharing.